I don't usually buy swiss brown mushrooms (well, make that never) as I am quite contented eating regular button mushrooms (which are cheaper by the way). The reason why I bought swiss browns was because there were some available for sampling at the markets the other day, and they were juicy and delicious cooked with garlic and lemon thyme. Apparently, these are the smaller versions of portobello mushrooms. They have a more intense flavour than button mushrooms and have a firmer, meatier texture as well. 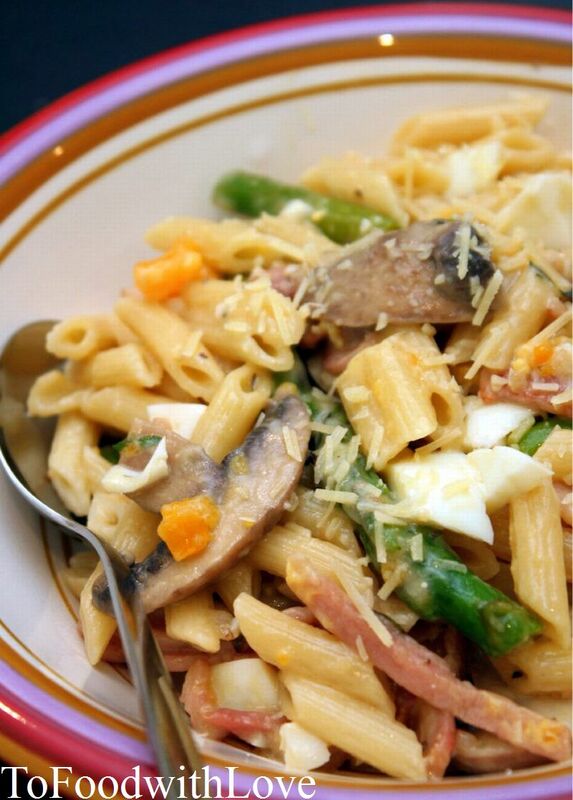 I decided to use the mushrooms in my pasta dish along with some bacon, asparagus and mashed egg. I used mini penne rigate for the pasta as I find them tiny enough that I don't need to cut them into bite-sized pieces for the kids to eat. I added vegetable stock and simmered the mushrooms in it to bring out the rich earthy flavour that swiss browns have. For the herbs, I used thyme because I simply love thyme (and I really think everyone should plant some thyme at home...they are really useful!). And the mashed egg (I love eggs too) just makes the dish a little more complete. 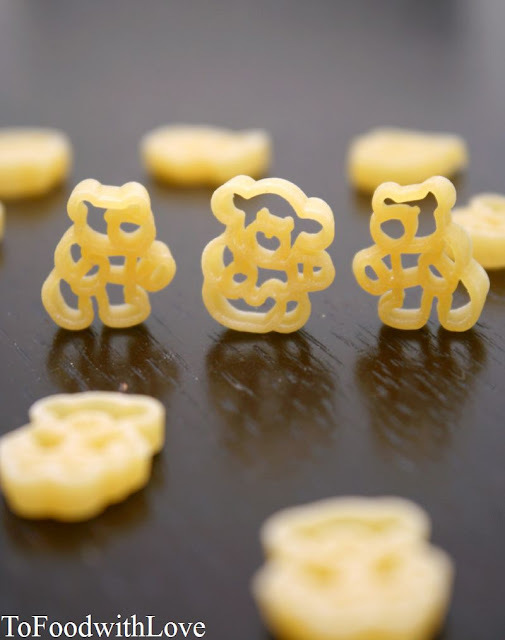 H loves this, especially when I serve it with teddy-bear shaped pasta, which is her favourite! Heat up oil in pan and fry bacon for 3 minutes, then add garlic and fry for 1 minute. Add butter, then onions, mushrooms﻿ and thyme. Fry until mushrooms start to soften. Add stock and simmer for 5 minutes. Add lemon juice and cream. Stir and bring to a simmer. Add salt and pepper to taste. Add the asparagus and stir in the parmesan. Turn off the heat and mix in the chopped egg. Toss the pasta with the sauce and serve with addtional grated parmesan.